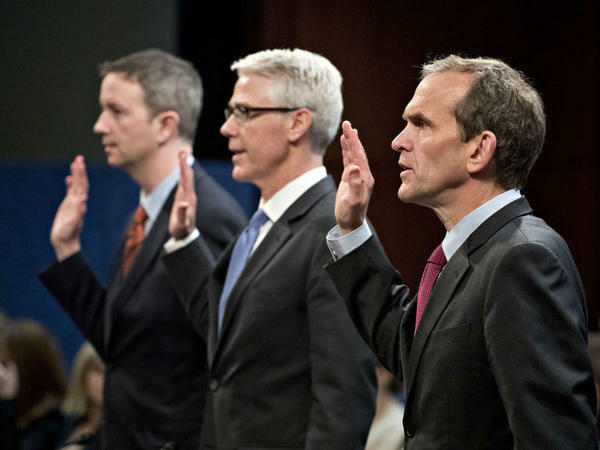 From right: Kent Walker, vice president and general counsel with Google Inc.; Colin Stretch, general counsel with Facebook Inc.; and Sean Edgett, acting general counsel with Twitter Inc., swear in to a House Intelligence Committee hearing in Washington, D.C., on Nov. 1, 2017. The carefully worded apology defines Zuckerberg's position for Tuesday afternoon, when two Senate committees hold a joint hearing, and for a House committee hearing Wednesday. He is to be the only witness at each session. The social media data problems have hurt Facebook's image, and chilled relations between Capitol Hill and the tech industry, one of America's most powerful sectors. Facebook, Google and Twitter all were exploited by Russian-backed operatives during the 2016 presidential election. Zuckerberg and some others in Silicon Valley say regulation might be needed — a reversal of the industry's long-held position. "I think it's a watershed moment both for policymakers and technology companies," said Nicole Wong, formerly a lawyer at Google and Twitter, and deputy chief technology officer in the Obama White House. She told NPR that social media companies lost track of the social implications as they built new platforms. "They are now realizing how little the public understands about how data and social media environments work," she said. In the early days, Silicon Valley and Washington largely ignored each other. But in 1998, President Bill Clinton's Justice Department accused Microsoft of building a software monopoly. A settlement was negotiated, and the tech companies got a lesson: They needed Washington lobbyists. "You hire a lot of lobbyists who are well-connected," said Lee Drutman, who studies lobbying at the think tank New America. He laid out how the companies work Washington. Facebook opened its D.C. office when it was five years old — and already worth billions. It routinely hires lots of top-tier, veteran lobbyists, as does Google. The current lobbying environment is ideal. Many lawmakers still don't fully grasp the technology. Congress long ago defunded its in-house technology office, which could have taught them. Facebook reported its 2017 lobbying cost at nearly $12 million. Google spent even more: $18 million. Drutman said it's important to "spread a lot of money around." Some of the money goes to think tanks, where experts can shape policy debates on Capitol Hill. For one example, New America, where Drutman works, has had grants from both Google and Facebook. Then there's campaign money. As Drutman put it, "People get that warm glow of 'This company's a good friend to my campaign.'" Facebook's PAC and employees made political contributions totaling $4.5 million in the 2016 cycle, according to the nonpartisan Center for Responsive Politics. For Google's parent company, Alphabet, the total was nearly $8 million. "Then you go in and you make your case," Drutman said. "Google and Facebook have become so central in our economy, it's not surprising that they have become tremendous players here." Internet-content companies set down a marker in 2012, when they mobilized their users against anti-piracy legislation that Hollywood wanted. 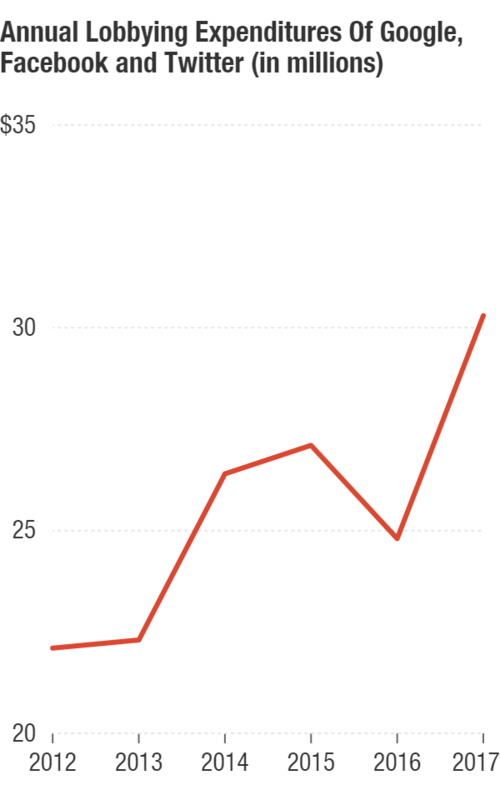 Capitol Hill got roughly 18 million messages opposing the bill, which then died a quiet death. Republican John Boehner, then speaker of the House, told reporters, "It's pretty clear to many of us that there's a lack of consensus — at this point." The current crisis is different. Facebook, rolling out strategies to calm the situation, says it plans to contact all of the possibly 87 million users whose data were scraped. Last week, Zuckerberg said the data-scraping concerns went even further than thought, due to a Facebook search tool people usually have switched on. "We've seen some scraping," he said. "I would assume that if you had that [search tool] setting turned on, that someone at some point has access to your information in this way." So Congress faces tangle of complex problems. But Wong suggested a congressional hearing may not be the best place to deal with them. "People, I think, are going to be watching it to evaluate Mark Zuckerberg's performance, or for a 'gotcha' moment, rather than thinking about it as an important piece of a broader conversation about the role of social media in our lives," she said.